The Tube Pro is an accessory system we have developed specifically for placing labels on Vials and Tubes. Configured specifically for laboratory and medical markets the Tube Pro is a highly versatile system. 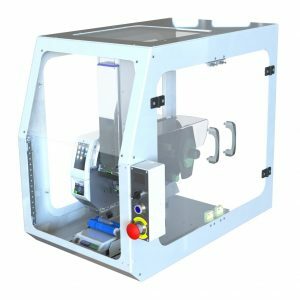 It can be operated in tandem with any of our Applicator products including the PL Series for precision placement of pre-printed or blank labels, the LC100i for precision ‘zero queue’ print and apply, and the PL100-TTP/PL165-TTP for print and apply that does not require ‘zero queue’ and/or for unique label configurations. The Tube Pro provides a precision system for wrapping Labels around Tubes and Vials. It features ‘rapid changeover’ without the need for any tools to transition between different types and styles of Tubes or Vials. The system is configured for semi-automatic operation. Fully compatible with any type of Tube/Vial including those with Caps, Ribs, Tapers, etcReturn to PRINT AND APPLY.